This is a guest post by Abraham Samuel Shiff, who studies historical topics and has published on William Shakespeare and William Blake. 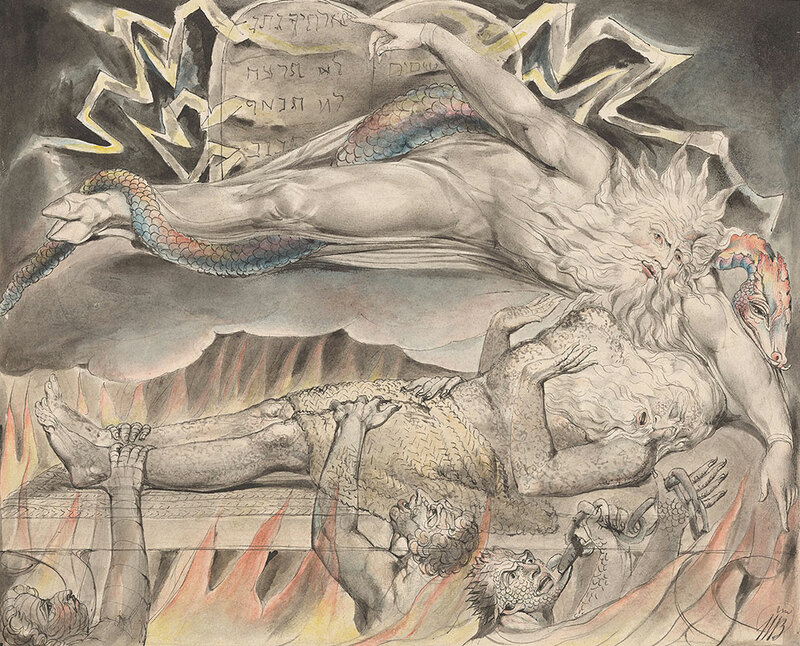 William Blake (1757–1827), Job's Evil Dreams, 2001.73. When I reached retirement age in 2006, I was free to return to graduate studies full time. I enrolled in the history department of Brooklyn College and also studied at the Graduate Center. In a course on the history of science at the Graduate Center, I was assigned to report on an Elizabethan mathematician who was the first to publish in English on the radical theory of Copernicus. The mathematician published a map of the Copernican planetary system. My attention was drawn to the Elizabethan’s description of the orbit of the planet earth, which was labeled: “this orb of mortality.” The label of a ‘mortal orb’ resonated with a memory of the famous line from Hamlet, “When we have shuffled off this mortal coil.” I wondered—was this line by Shakespeare somehow linked with the radical theory of Copernicus? This became my Brooklyn College master’s thesis topic: Hamlet's Mortal Coil: Metaphor for the Copernican New Astronomy and the Nova of 1604. My research into the Elizabethan age for the Mortal Coil thesis brought me to the magnificent resources of the Morgan Library & Museum, where I systematically read through its holdings of Elizabethan and Jacobian era books. In the Morgan, I discovered another historical fact. King James, in a presentation to Parliament, made reference to an incident in the reign of his predecessor, Queen Elizabeth. The words of James led me to a well-chronicled incident recorded in the contemporary histories of Elizabeth’s reign. She was insulted by a Polish diplomat. Could this be the clue to understanding why Shakespeare changed the name of the Hamlet chamberlain-character? When the first edition of Hamlet was published, the mocked, bumbling, and verbose chamberlain was named Corambis. In the second published edition, the name was changed to Polonius. Was this alteration made by Shakespeare to entertain his audience by mocking the Polish ambassador? By this time, I was matriculated in the Master of Liberal Studies program at the Graduate Center, City University of New York. The Corambis/Polonius topic became my second post-retirement master’s thesis, entitled Polonius Identified: Scandal to Pun to Gossip to Print. Both Shakespeare theses are published on the online scholarly site devoted to Hamlet studies, hamletworks.org. 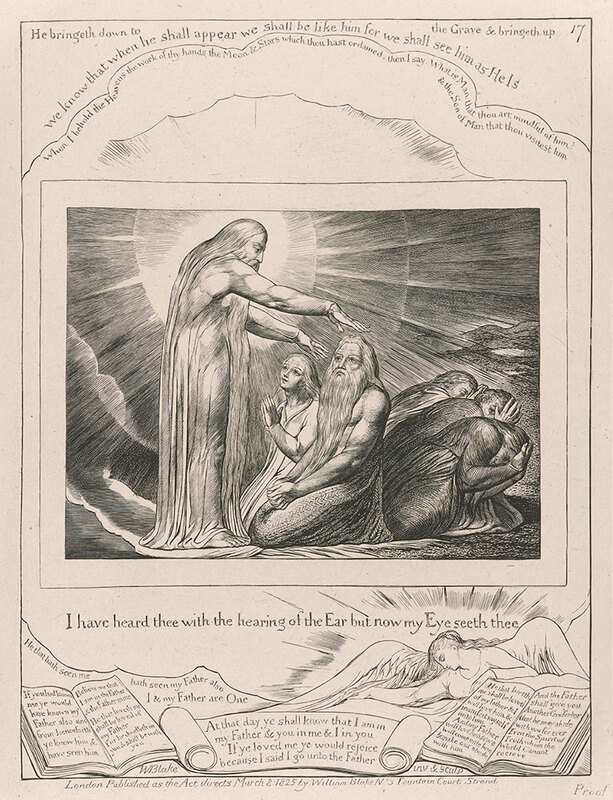 Illustrations of the book of Job / invented and engraved by William Blake 1825, PML 30214. 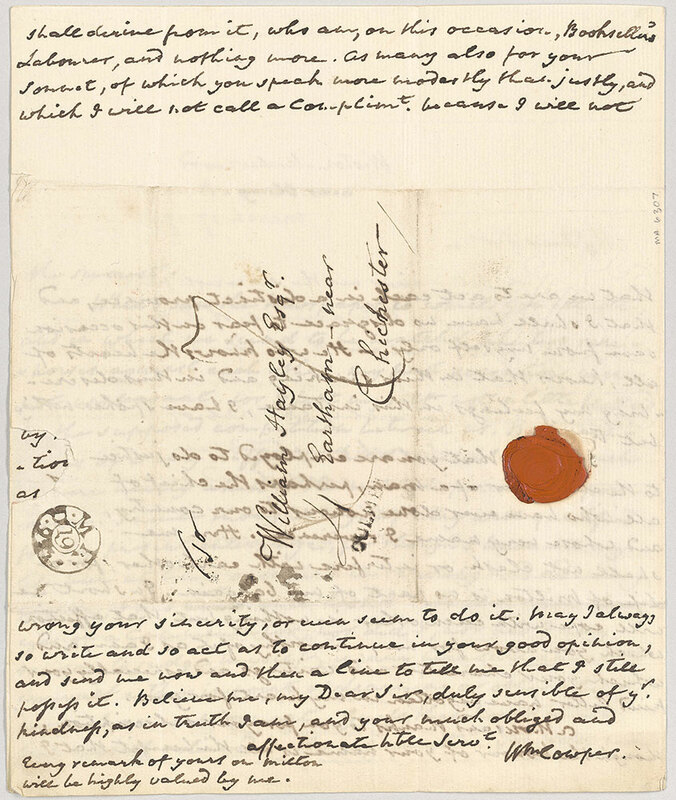 Letter from William Cowper to William Hayley, 1792 March 17, MA 6307. In 2009, while I was still researching Shakespeare, the Morgan Library & Museum mounted a major exhibition of William Blake, curated by Dr. Anna Lou Ashby, Andrew W. Mellon Curator (now retired). Dr. Ashby requested my assistance. She gave me a private viewing of the exhibition before it opened to the public, pointed to one of Blake’s works that had Hebrew in the art, and asked if I would provide a translation for the docents who were to guide tours for the expected throngs of viewers. I confess that at the moment I entered the exhibition hall, the only knowledge I had of Blake was a dim memory from high school English, a half-century old, about an unfortunate tiger that somehow set itself afire. After examining the works on exhibit, my impression of Blake was considerably altered. I owe a great debt to Dr. Ashby for introducing me again to Blake, making available for study his works in the Morgan’s collections, having patience with my incessant questions, and critically reviewing my paper, “Blake’s Hebrew Calligraphy”, that was published in Blake/An Illustrated Quarterly in 2012. I sing paeans of Anna Lou Ashby at every opportunity, as I do here. While researching “Blake’s Hebrew Calligraphy” at the Morgan, I came to recognize that in his art he repeatedly used a hand gesture that is a symbol of the Jewish religious ritual of priestly blessing. Blake’s use of this immanentistic emblem was never before reported, and it became the topic of a second paper, “Blake’s Priestly Blessing,” published in Blake/An Illustrated Quarterly in 2013. Now In a third paper, I analyze Blake’s use of Hebrew in his epic work entitled Milton. Blake punned on Milton’s famed mastery of elision as a poetic technique with two words in Hebrew. The Morgan’s superb resources provided direct evidence in an autograph letter from William Cowper to William Hayley, 17 March 1792 (MA 6307). It supports the thesis that William Blake’s knowledge of Milton’s use of elision in composing Paradise Lost was influenced by William Cowper through Blake’s patron, William Hayley. The paper, William Blake’s Hebrew in Milton and Ololon—Deciphering Blake’s Hebrew Puns, will be published as a monograph in 2019. But there is more to report. Belle da Costa Greene, the legendary librarian to J. Pierpont Morgan and the first director of the Morgan, posts she held for nearly half a century, has left an archive of correspondence that has not been systematically studied. For the past three years, I have been reading through the archive finding topics of interest that reflect on the operations of the Morgan Library & Museum. This should yield some papers of historical interest dealing with Ms. Greene’s administration and with the Morgan itself. Research at the Morgan is possible because of the dedicated efforts of the librarians that support the scholars who utilize the Reading Room. I take this opportunity to express my appreciation to the library staff for their support of my research over many years, currently under the competent direction of María Isabel Molestina, Head of Reader Services. Abraham Samuel Shiff enjoyed careers in pharmacy, administration, and computer programming. In retirement he studies historical topics. He has published on William Shakespeare as well as William Blake. He is currently at work on a monograph to be published in 2019 on Blake’s epic poem Milton; and is researching topics of interest in the history of the Morgan Library & Museum. Mr. Shiff holds degrees in Clinical and Hospital Pharmacy, Physiology, Healthcare Administration, Computer Programming, History and the Liberal Arts.